On Saturday, 12 March, Labor Minister Ahmed Hassan El-Borai took part in a panel discussion with Kamal Abou-Eita, head of the Independent Syndicate for Real Estate Tax Employees and Kamal Abbas, coordinator of the Centre for Trade Union and Worker’s Services. El-Borai announced that the ministry was keen to allow for trade union freedoms within Egypt, especially considering the country’s strategic and historical role in the international labor arena. The minister, to the delight of the audience and his fellow panelists, declared his commitment to both the national and global implementation of the principles of free trade unions, based on Egypt’s recent political and social awakening. With tears in his eyes, El-Borai stated with resolve that workers would soon have the right to establish, form and join any trade union of the choice - trade unions which would remain completely independent of the ministry. These unions would be able to independently conduct their domestic affairs, develop regulations, allocate their funds and choose their own leaders. El-Borai made some around him unhappy when, regarding the sit-ins in Suez, he stated, “You either work and come discuss your demands with me or you don’t. I don’t talk with those who sit-in.” This drew a reaction later from Kamal Abbas who stated, “It is not a crime to sit-in” and asked, “Is it a crime to protest, are martyrs of the revolution criminals?” Abou-Eita made similar comments, arguing that the country must step away from these black and white categories, for there are “the oppressors and the oppressed” and nothing else. The labour minister soon apologised, indicating that he agreed with the right to sit-in but was concerned about the country’s fragile economic situation. 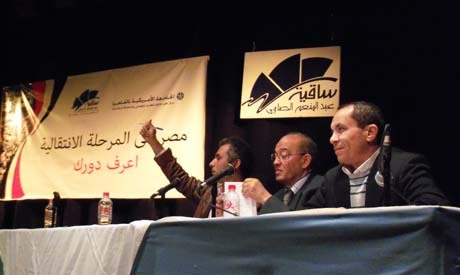 The panel discussion, part of a series entitled “Know your Role”, was moderated by journalist Moustafa Bassouni and focused on the role of the labour movement prior to and during Egypt’s current transitional process. Kamal Abbas, who began the discussion, focused on the history of Egypt’s labour movement and tied the country’s workforce irrevocably with Egypt’s 1919 and 1952 revolutions. He also drew parallels between the current youth movement and the workers uprisings during September of 2007 in Ghazl El-Mahla.